Social media is a difficult place for brands to be in. With 89% of businesses creating content for social media today, it’s quite a saturated and competitive landscape, and it doesn’t look like it is slowing down anytime soon. Moreover, people share 1.3 million pieces of content on Facebook every minute of every day, total 500 million tweets are sent per day, and almost 85 million videos and photos people are uploaded every day to Instagram. To win the battle between your competitors, being boring is not an option. As a follower, going to someone else for entertainment from posts in your niche can be done in a heartbeat, and if you are boring your followers, they won’t hesitate to do so. 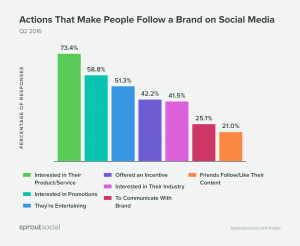 In order to get the most out of social media, and to ensure that you aren’t more boring than your math teacher in 5th grade, you need to know why people follow your business on social media. When you know, you need to start engaging with them and provide them with content that actually brings them value and that they find interesting. You don’t want to be sharing promotional post after promotional post, letting people know about a sale you have going on, or that you have a new product coming up. Why? Because social media is not just about throwing ads all over the place. At least that’s not the reason why people are following you. You need to figure out what they like and keep feeding them with it, at the same time you’re adding a piece of marketing every now and then. Of course in a very careful way. 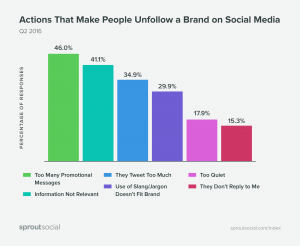 In fact, 46% of people unfollow a brand on social media because they share too many promotional messages. As you can see, social media for brands is quite a dilemma. Either you bash out marketing post after marketing post in the hopes of getting any sales (which you probably won’t, because people will tune out and unfollow you). Or, you can feed them fun and exciting content that won’t bore them to death. To me, the choice is quite obvious. If you choose the most obvious, you’ve come to the right place. In this article, we’ll look at 8 Ways to Avoid Boring Your Social Media Followers to Death. I’ve spoken about this many times before, but I feel like I cannot stress this enough because it lays the foundation to any successful social media presence. In order to be successful on social media – especially as a brand. You need to provide value with the content you share in one way or another. When some people hear the world value, they believe that you need to give real value, like in actual money, but this is of course not the case. Value can be so much more than actual cash or products, and when talking about social media, it normally is. Value can be something as simple as providing follower with information, giving them the latest news, or simply just tell them about something they care about. And, it can be a giveaway, where you actually give away “real value” in terms of a physical product. As a brand, you are going to want to use promote yourself, and that is completely fine. What you need to be very careful about is sharing too much marketing posts. You need to find that perfect balance. Some people talk about the 80/20 rule, others about the 50/50 and so on. What this basically means is your distribution and mixture of marketing posts and non-marketing posts. Unfortunately, I cannot tell you an exact number, because frankly, there is no such. Your best bet is to experiment, but remember that it is better to share too little promotional content than too much. Also, as you get to know your audience and what they resonate well with, you’ll be able to share content that both markets your brand and provides value to your audience. The video is circulating around the brand and their products, however, they’re marketing them in a way that comes off as okay due to the fact that it also provides their followers with a good laugh (value) which makes up for the promotion in the video. The single biggest reason is that they’re interested in your brand. And let me tell you, people won’t get more interested in your brand just because you share more ads. It’s more of the opposite. The second biggest reason is that they’re interested in promotions, and here’s where it gets interesting. It’s easy to mistake this as a calling from your audience that you should share more promotive content and more ads on social media, but this is certainly not the case. First off, they are only interested in promotions. This means that if you don’t have any promotions, your audience basically don’t want to see or hear about it. Second, it doesn’t mean that you should start bombarding them with ads. It’s like the Swedish word “lagom” that has no direct translation to English, but it means not too little, not too much. When sharing content and you want to avoid boring your followers, something you also want to consider and think about is the type of content you share. Note that the sub-heading said “relevant content”. The word relevant means that you should share content that your audience actually cares about. What relevant basically means is that it needs to be aligned with your niche. If your brand is operating in the vegan food industry, chances are the vast majority of your followers will be vegans. If you, all of a sudden start sharing marketing posts about beef jerky, or post an image of you at a farm with animals in captivity, it won’t resonate well with your audience. While quite an extreme example, this is how you should think about relevance when sharing content. Before you share a post, ask yourself: will people within my niche actually care about this? The second point and this is quite important, is that you want to be entertaining. You probably have a few friends that are highly entertaining and crazy that always makes you laugh. Do you ever get bored with them? Probably not. In fact, that’s probably the least of your concerns when spending time with them. Being entertaining is the single most effective solution against boring your social media followers to death, but what does it really mean and how can you implement it into your social strategy? First off, you want to make your marketing posts a lot more entertaining. There’s not much that is as boring as sharing a plain image with a text announcing that you are having a sale. If you’d use the mentioned method, that would be the boring way. The entertaining way is about going outside of the box, and daring to do something extra. Instead of sharing a regular boring photo with a caption, they created an interesting and appealing video as well as two other videos in a slideshow. This encourages interaction, increases the retention rate, and keeps the announcement more engaging and interesting. On social media, the competition is simply too great to share boring announcements, whether it be about a grand sale or a product release. To get the most out of your campaign, and to get the most marketing juice out of your Instagram efforts, you want to do something that is new, fresh, and out of the box. Not something that has been done a million times already. All social media platforms support visual content. While platforms like Twitter are mainly focused on the written word, visual content still shows that it outperforms written content on those platforms – as well as platforms dedicated to visual content like Pinterest and Instagram. I could spend this whole article rambling on about the power of visual content on social media, but that would keep us here all day. And I think you get the point. 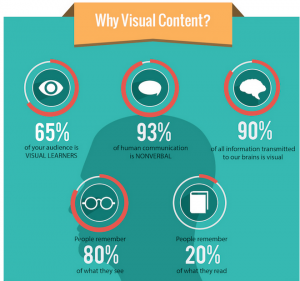 Visual content is more appealing, more interesting, and keeps your audience glued to your post longer. 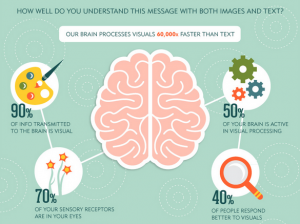 Most importantly, people only remember 20% of what they read and 80 percent of what they see, meaning that by using visuals, you can be remembered by your followers for a longer time. As with anything though, you have to post the right visuals. You can’t just share any photo or video you like and expect it to get good results. It has to be relevant to your niche, it has to be relevant to your audience, it has to be relevant to your brand, and it has to be relevant to your visual theme. To do this, you need to create a coherent style and brand message when it comes to your visual content so that you aren’t posting images that have no correlation between each other. 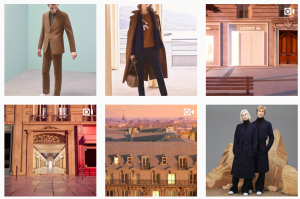 You can take inspiration from the most successful brands on social media. These have mastered the art of sharing coherent content – that is still different, creating a sense of “brand style” and brand message, allowing people to instantly recognize the content shared by the brand. Their Instagram posts are extremely similar and coherent, while still being very different. They have been able to create images that have a similar feeling, colors, and “softness” – conveying Lacoste’s style, and the feeling they want to mediate to you. The number one thing you can do to bore your followers to death is to share boring ads. Think about it: What do you do when the commercial goes on on your TV? Chances are, you switch the channel, run away as fast as you can, or turn the TV off. At least that’s what the majority of people do. What does this mean? It means that just because you are bashing out ads on social media, you won’t generate great results from it. In fact, posting too much promotional content on social is a huge risk that you have to be well aware of, and have a great strategy for if you want to generate great results. I’ve already talked about how you should approach ads on social media quite a bit, and that will take you a long way. But having in mind that nobody wants to see ads all the time because it’s boring and a surefire way to get people to unfollow you is vital for avoiding being stamped as boring and overly promotive. Continuing on the point before of not only making social media about yourself. Social media is called social for a reason. If you’re only standing and talking about yourself, eventually, people will get extremely bored. To mix up your content strategy, invite other people to join in on the fun, you can avoid the boring stamp in your forehead. User-generated content is not only great because it gets your audience engaged and makes you look like a more fun brand, but it is also great because it gives you valuable content that you can use so you aren’t forced to produce content all the time. And more importantly, you get content that holds more converting power than your regular professionally-created content. In fact, according to the Nielsen Consumer Trust Index, 92 percent of consumers trust organic, user-generated content (UGC) more than they trust traditional advertising. Your followers appreciate when you share their content because it shows them that you value them and that you acknowledge them. 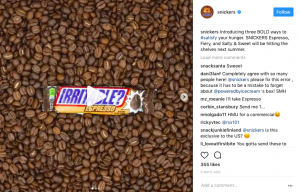 You have to find a balance between your own content and user-generated content, but UGC is often highly appreciated and liked by both the person getting reposted and by the audience, so don’t be afraid of using a lot of it. Just make sure that you make it clear when the post you share is from your customers/fans, and never give up completely on your own content as well. Interaction with your audience on social media is the single most important thing for social media success, and no matter what issue you’re discussing, interacting with your audience tends to almost always be part of the solution. By interacting with your audience, you build your relationships with them, which ultimately leads to more trusts. And considering the fact that trust is one of the most important factors to driving sales, it’s quite an important one. People don’t use social media solely because they want to listen to others talk. The same goes for when you are shoving ads down their throats. How will they be able to speak? No. People use social media because they want to listen, process, and they join in on the conversation. When they do, you need to meet them. And most importantly, if they are a bit shy, you need to use different methods to get them to engage with you. Most of the time when it comes to brands on social media, the problem is that the brands aren’t responding to their audience, not the other way around, so you don’t need to worry too much about getting people to engage with you in first hand. But once you’ve got a hold of it, you definitely should, because it is extremely valuable. When people mention a brand on social media, they expect a response 99% of the time. And they expect it fast! In fact, people expect you to response within 4 hours after they’ve written you something. 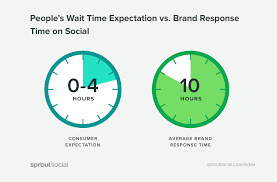 Unfortunately, the sad truth is that brands, on average, respond after 10 hours! And this does of course not send good signals to the audience. If people write to you but don’t receive a response at all – or long after 4 hours, what should they think about your brand? That your customer service is terrible? That your brand is bad? These things can be the result of not responding and responding in a timely manner. One thing that is for sure though is that they’ll think you are boring. The key to building powerful relationships with your audience is showing that you value each and every one of them by taking the time to respond to them with a bit of personality and being genuine. When you do, people will feel important and valuable, and that’s something highly valuable for brands. A win-win situation in other words! Your brand has a personality – whether you know it or not. Whatever the case might be, you want to clearly define your brand’s personality and the brand message you have in your social media strategy so you can keep your branding and personality consistent. Having a personality as a brand won’t do any good if it changes every week. It will instead have an opposite effect. Therefore, having it clearly defined in your social media strategy will allow you to go back and take a look every time you get a bit unsure. There is not much that is more boring than a brand without personality. You’ll just end up blasting out post after post, message after message, sounding like a robot that nobody will have the ability to build a relationship with. Many brands excuse not having that much of personality with that they want to be professional but to that, I say bull crap. There is too much evidence to how brands that show personality generate amazing results on social media that we cannot deny its powers. When talking about brand and personality, voice and tone are often spoken about. “Voice: What does your brand consistently sound like on social media? Another way to understand this is to think about your brand’s personality. You probably have an idea of what personality you have, and this should be highly dependent on the people you are trying to target. If you decide that your main personality should be highly serious and conservative, you will probably not do very well if your target audience consists of teens. If you do, they’ll see you as boring and they’ll run as quickly as they can. The key is developing a brand message and personality that resonates with your target audience because this is a surefire way to avoid being considered as boring. Another way to be boring is to post the same content over and over again. 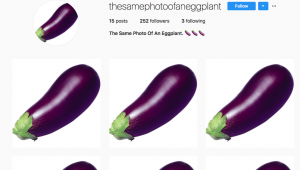 The post does not have to be identical and repetitive as @thesamephotoofaneggplant to be considered boring. 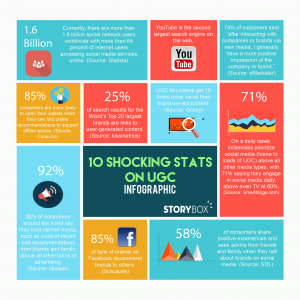 We’ve already talked about how you can mix up your content with UGC and that’s a great start! Also, I cannot emphasize this enough, but there is no “secret recipe” or “perfect mix” that tells you exactly how many posts of this and that you should post. This is about trying and figuring out yourself what works the best. There are tons of different types of content you can use, and of course, not all work for every brand, but there’s something for everyone. It’s easy to bore your followers on social media by posting the same content over and over again, never interacting with them, and sounding like a robot without emotions or thoughts. But it is quite difficult to come off as a human with feelings and thoughts that is fun and engaging. By removing the things that can make you seem boring on social media, you have come well on the way to making you and your social media more exciting and interesting.